When an employee leaves you will need to update Cashmanager RURAL. You will need to calculate and enter their final pay, including any outstanding amounts like holiday pay. You will also need to make the employee inactive in Cashmanager RURAL, so they stop showing in your tax returns. Enter their finish date or last date of employment. Tip: do the steps in order to prevent getting errors. -- > First of all you will need to manually calculate the details of the final pay, including gross wages and tax, holiday/leave pay and tax on holiday/leave pay. Note: you can’t use the PAYE calculator for final holiday pay as it will be taxed as an extra pay - refer to taxing holiday pay. You can also call your tax office for queries and advice. Scenario: Fred farmer has resigned. For his final pay he is owed 80 hours work and 32 hours of untaken holiday leave pay. 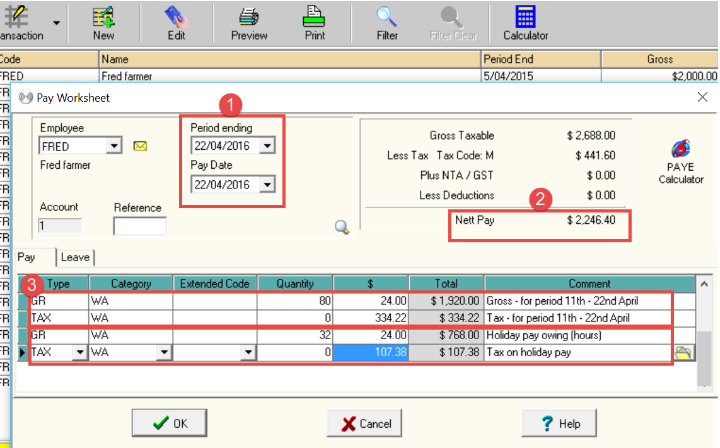 -- > After calculating the final pay, enter the details into the Wagebook in a new pay worksheet. Period ending will be the last day of employment. Pay Date matches the date the payment is made at the bank. The Nett pay is the payment amount made at the bank. Breakdown the final pay by working out wages and final holiday/vacation pay separately. You may also have other allowances and deductions entered here, such as accommodation. -- > To make an employee inactive, go to Setup>Other Party. Turn the Employee field to ‘Inactive’. Tip: if any other roles are inactive, the employer can change the status for these as well. Fred no longer shows as an active record in the Setup Other Party screen. 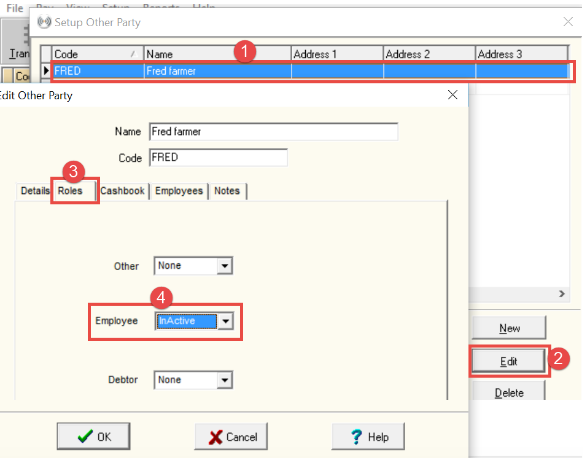 -- > In the Edit Other Party screen select Inactive Records to find Fred and click Edit. 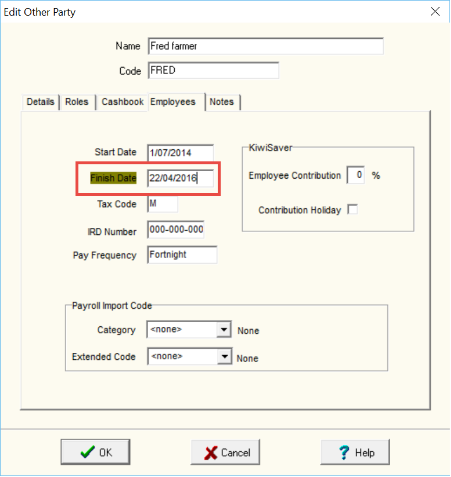 -- > Enter the Finish Date as the same as the Period ending date you entered in the first step.